On the occasion of Union Station’s 75th anniversary, Metro created a special commemorative publication, Union Station: 75 Years in the Heart of LA, featuring eight written and five photographic essays that celebrate the station by authors John C. Arroyo, William D. Estrada, Stephen Fried, Rafer Guzman, David Kipen, Marisela Norte, D. J. Waldie, and Alissa Walker. The book is on sale now at the online Metro Store. All essays are posted on The Source. The series was edited by Linda Theung, an editor and writer based in Los Angeles. 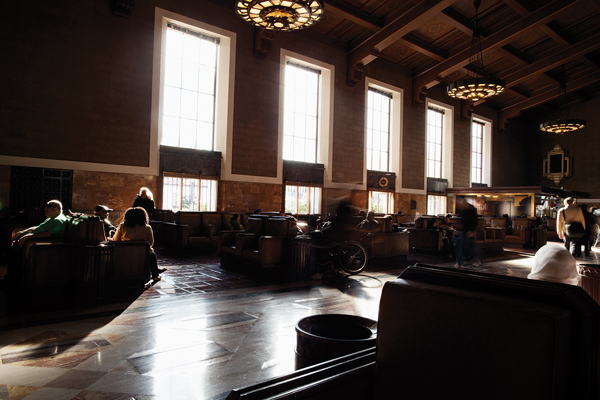 If it’s possible for a place to have memories of its own, then Union Station in Los Angeles is such a place. It’s also the hub of Metro’s regional transit system and a railroad terminal—people hustle through Union Station for those reasons—but the patient sojourner who sits in one of the throne-like chairs in the waiting room or steps into the adjacent patios inevitably slips out of the everyday and into the station’s own time. Time was when a giant sycamore shaded native Tongva elders debating village disputes a few hundred feet from where the station’s tracks would be laid. The arrival of Spanish colonists from Sonora and Sinaloa in 1781 swept aside the elders and the village. The sycamore lived on—more than sixty feet high, spreading nearly two hundred feet—until it was felled in 1892. Later still, the neighborhood that grew up around the sycamore was so culturally diverse that Chinese herbalists dealt from clapboard shops next to tenements occupied by exiled pacifist Russian Molokans and refugees from Mexico’s revolutions. The shops and the tenements were razed by 1936 for the building of Union Station. Some of the Mexican refugees had already become vendors on Olvera Street. Some of the Chinese moved to New Chinatown not far away. 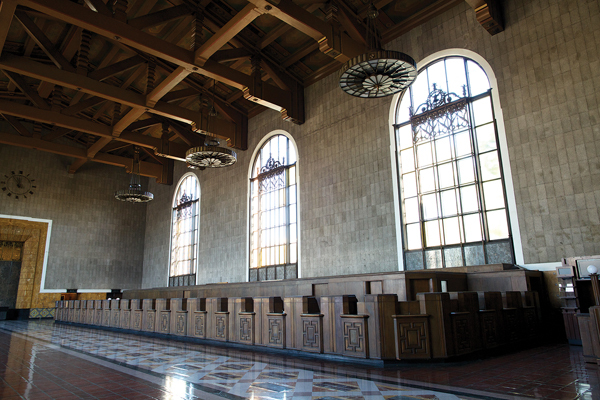 By design, the builders of Union Station reframed the image of Los Angeles for tourists. Some of their first sights would be fantasies of exoticism. To arrive at the station most travelers would have passed through the San Fernando Valley, quartered into orchards and ranches in the 1940s and subdivided into suburban house lots in the 1950s. As they neared the station, their train would have followed the trace of the Los Angeles River, an open wash in 1939, but by 1945, already a concrete-lined channel in the making. Arriving passengers in those years would have stepped down from their Pullman car, walked the echoing tunnel beneath the tracks, and entered the station—a space both monumental and deferential, designed to impress and reassure. Outside, Los Angeles sprawled and brawled and offered the traveler the option, if he was willing to pay the price, to endlessly reinvent himself. Inside, in the minute or two it took to walk beneath the painted ceilings and past the waves of colored tile on the walls, Union Station would have had just enough time to say to the new arrivals, “You’ve come to Los Angeles where brilliant light is dominant, but see how it’s tempered by this space, these fountains, and these flowering trees.” The travelers’ first experience of Los Angeles would have been that transformed brightness. Commuters arriving at Union Station today aboard the Metro Red and Purple Lines or Metrolink and Amtrak trains pass through that same light, unchanged in seventy-five years. Marble blocks in the floor are grooved from the tread of vacationers, aspiring starlets, and the unremarked mass of those embracing or abandoning Los Angeles—and, if you cannot put yourself in their shoes, you can put yourself in the light they encountered. It puts you outside of ordinary time. It’s still the light of nowhere else but Union Station. The shadows are the same too. By a frequent quirk of the still air over downtown, shadows at Union Station are sharp and deep, as if drawn by a ruler and inked in. The shadows are there by design—to give shelter in the long arcades, contrast to the white of walls, and movement throughout the day to the static weight of the building. John and Donald Parkinson, the station’s supervising architects, understood the shadows of Los Angeles and how pausing in them still invites daydreams. Ephemeral patterns of light and dark cascade across durable patterns in concrete and marble. Courtesy of the Los Angeles Railroad Heritage Foundation Collection. In the Parkinsons’ concrete reverie of mingled Spanish Colonial Revival and Art Deco styles, Union Station appears as if from an alternate history—an imagined past of Los Angeles, where Moorish craftsmen ornamented an Andalusian basilica with tiled geometry, where Franciscan gardeners enclosed little paradises of orange and olive trees, and where it’s possible even now to slip from the present into that past and back again like a passing shadow. 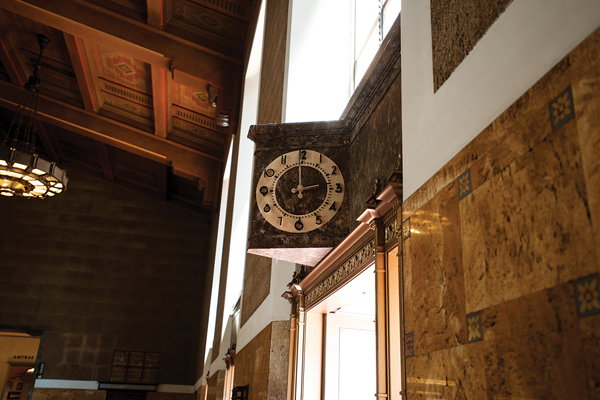 Transient light and dark still make patterns on the Montana travertine walls inside Union Station, marking local time without reference to the clocks on which trains and buses run. And there are equally durable patterns in the 75,000 square feet of concrete and marble floors, and glazed pottery wainscoting, on the tiled benches and doorway surrounds, and even in the brick parquetry of the patio walkways. Patterns in tile and stone hybridize at Union Station, partly Hispano-Moresque and partly Mexican, Native American, and Hollywood Art Deco. Pale rosettes on a blue background punctuate the walls of the Old Ticket Concourse. A zigzagging design in ochre, burnt sienna, brown, and yellow tiles continues to jazz up what had been the Arrival Lobby. Eight-pointed stars repeat in the masonry grill over the entrance vestibule on Alameda Street and throughout the station. There are quartets of parrots on the walls of the closed (for now) Fred Harvey restaurant and Mexican leather stitching on the booths. 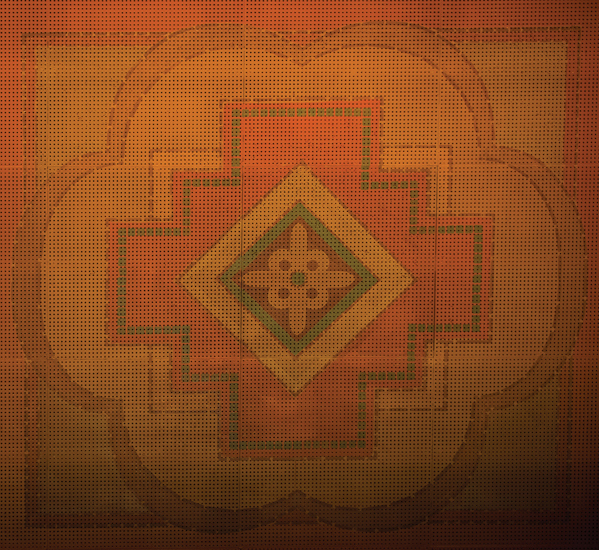 The restaurant floor is a block-long Navajo rug in terra cotta, white, and black Valencia Spanish tile, designed (as all the retail spaces at Union Station were) by Mary Colter, Fred Harvey’s architect. Somewhere between aesthetics and religion is the idea that a pattern of simple forms repeating over the expanse of a surface can be a metaphor for the orderliness of a knowable universe. The benches, arches, doorways, walks, walls, and floors of Union Station are beautifully patterned and continue a silent confession of faith to those who pass by today. 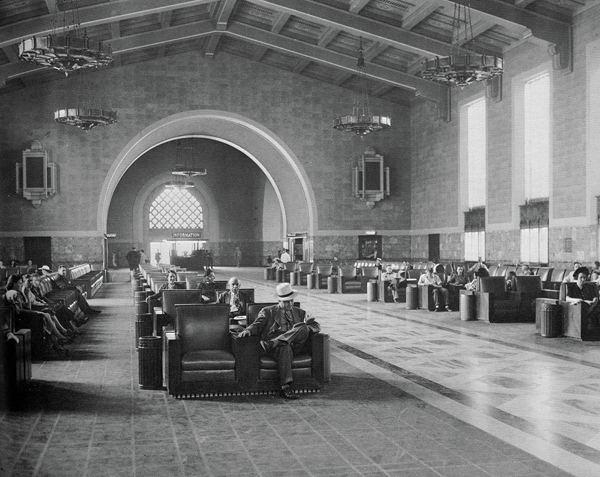 Los Angeles voters believed in Union Station long before it was built. In 1926, they overwhelmingly approved construction of a station that would unite the city’s three transcontinental rail lines—the Union Pacific; the Southern Pacific; and the Atchison, Topeka, and Santa Fe. The public saw mostly utility and convenience. The city’s power brokers saw the future they wanted their station to embody. Something of their aspiration is in the long vista from the elegant box of the entrance vestibule into the Old Ticket Concourse—soaring five stories high and with 115 feet of counters beneath a fretwork of faux wood beams and six chandeliers, each weighing more than a ton. 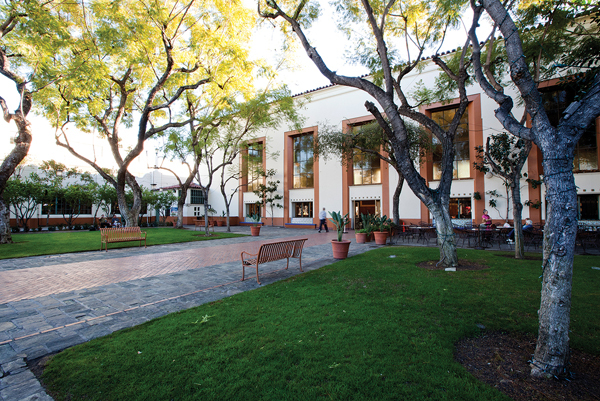 It’s in the landscaping outside—Chilean pepper trees, Amazonian jacarandas, and Mexican fan palms – intended to summon a vision of sunny, abundant Southern California. 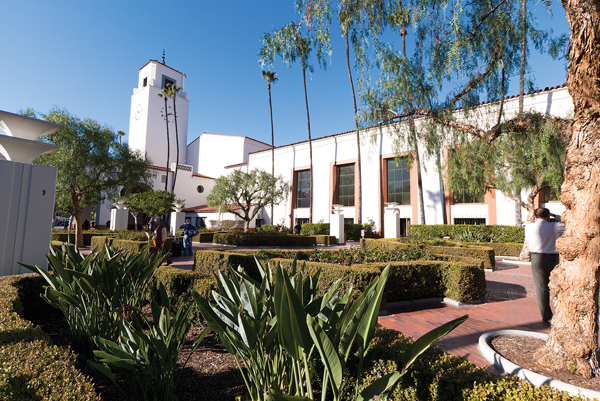 It’s even in the station’s clock tower and the façade opposite the plaza where the pueblo of Los Angeles began. Union Station isn’t just a beautiful building. It’s also a lesson about power and time. For the city builders of Los Angeles, a romantic Spanish and Mexican past was supposed to blend with an easeful present to achieve a triumphant, machine-age tomorrow, just as the architecture of Union Station said it would. Left out of the design were other figures—mostly people of color—who resisted fitting into that consoling synthesis of past and future. The outsiders’ claims on what Los Angeles should become weren’t satisfied by the informal eclecticism of Union Station or the tourist destinations of New Chinatown and Olvera Street or the granite acropolis that eventually rose on Bunker Hill. When Union Station opened in May 1939, everything about it reflected the city’s longing to be both modern and nostalgic. The view through Union Station today is far more complicated. Memories, some difficult, crowd the station. A train stopped at Union Station every fifteen minutes in the war years between 1942 and 1945. Most of those trains carried troops; some returned through Union Station as war dead. At times, as many as twenty military coffins passed through the baggage department every day; more arrived from Korea, and, later, from Vietnam. Some Union Station memories, though, faintly glitter: movie stars Humphrey Bogart and Lauren Bacall, Errol Flynn, Kim Novak, Margaret O’Brien, and Virginia Mayo, who had her portrait painted on the Super Chief en route to New York; singers Mary Martin, Marion Anderson, and Elvis Presley; and notables such as Madame Chiang Kai-shek, His Holiness Right Reverend Dr. James F. Jones (better known as Prophet Jones), Lord and Lady Halifax, Jim Thorpe and Ty Cobb. Other memories are more anonymous. After months and miles of separation, war brides met their servicemen husbands in the arrivals lobby. Japanese American internees returning in 1946 from an Arkansas relocation camp encountered four hundred Marines who had just returned from the war in the Pacific. Two thousand convention-bound Shriners poured out of the station in 1950, as did delegates to the Democratic National Convention arriving in 1960. All it takes is attention to patterns, vistas, shadows, and light—and knowing a few stories—to evoke the station’s memories and enable the visitor to slip through time via family reunions and last farewells, the boredom of travelers between trains, and the pieces of whatever Los Angeles represented to those who came by train to possess it. Union Station is a multimodal transportation center and a symbol of Depression-era optimism. It’s a glamorous architectural icon and a survival of past assumptions about Los Angeles that still complicate the city today. Union Station is a character actor in the movies and a working time machine. It is entertaining to have the option to be in more than one time while being in one place. But slipping through time at Union Station serves a purpose beyond amusement. Angelenos suffer from a willful forgetfulness about how their place was made and of what it is made. Union Station resists the city’s common amnesia. It remembers for them. The traveler who pauses there will encounter Los Angeles as it hoped to be (with its flaws), as it is today and as it yet may be. D. J. Waldie is the author of Holy Land: A Suburban Memoir, Where We Are Now: Notes from Los Angeles and other books about Southern California. He is a contributing writer at Los Angeles magazine and a contributing editor for the Los Angeles Times.